Networking sales scripts for joining my a referral group. Home > Scripts for business > Referrals "Join my referral networking group"
Networking scripts to get referrals are for salespeople who want to build their business through forming a networking group. Get referrals by forming a referral networking group. 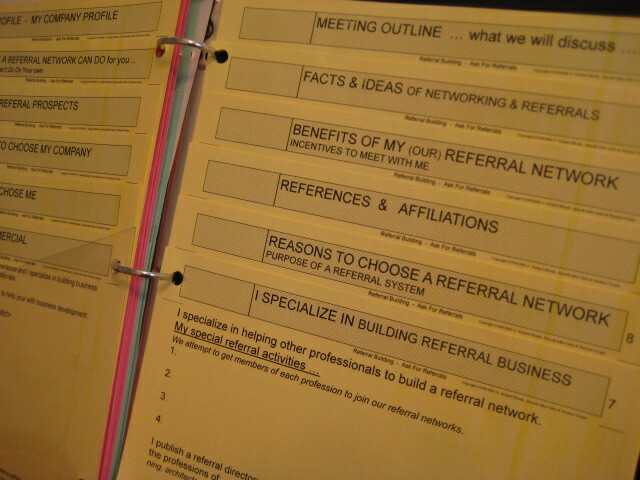 Networking referral scripts were written to help salespeople build their business by asking other professionals to send them referrals. Networking scripts for referrals were written as a result of discovering that sales professionals have difficulty with asking others to help them build business by exchanging referral clients. 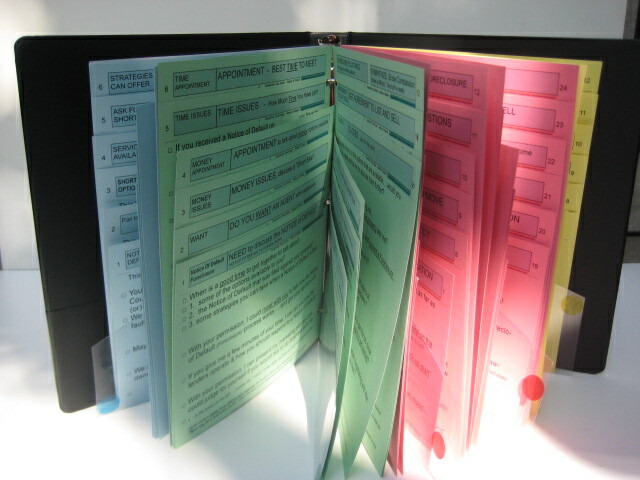 Networking to get referral scripts are written for people who want to build their referral business. For sales professionals who want the most cost effective way of building their business is to use a networking group for referrals script. 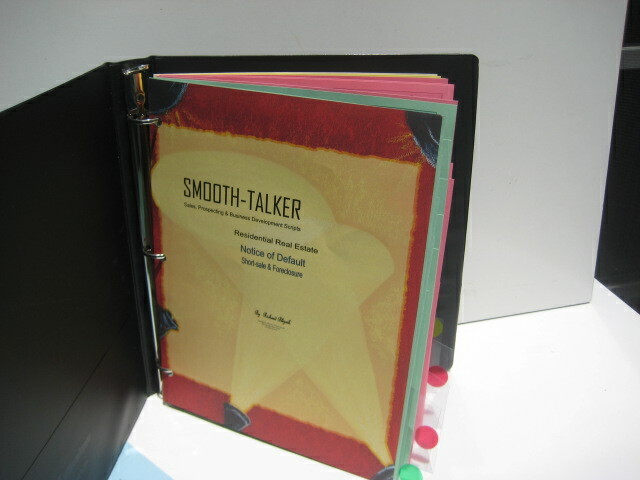 Written for all types of sales & marketing positions that require the salesperson to make their own prospecting calls. 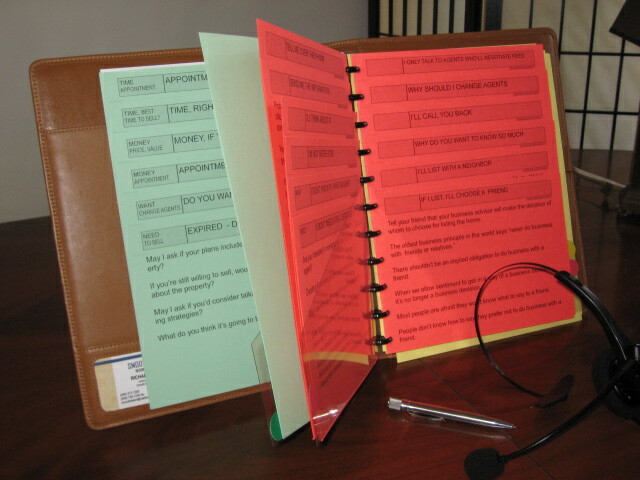 Includes a leatherette 3 ring binder, an Instruction Manual for Prospectingl, a Script writing kit and extra card-stock for writing additional dialogue. Calling for a referral is the most difficult call you will make. No one in the business world has yet to come up with a script designed to convince a professional to send you referrals. The most perplexing type of call you will make is for getting other professionals to send you a referral. It takes an experienced sale professional to write a referral prospecting script to help you to call someone you don't know and ask them to join a referral networking group. Calling on someone you don't know and asking them for referral is easier said then done. Approaching a person you have never met is difficult enough, and asking for referrals isn't their first priority. Unless you have good reasons for them to send you business, you are just like any other salesperson who calls. What do you say to another professional to build trust & convince them that you are worthy of their recommendations. It is a delicate thing to do when you call a complete stranger to get their acceptance. 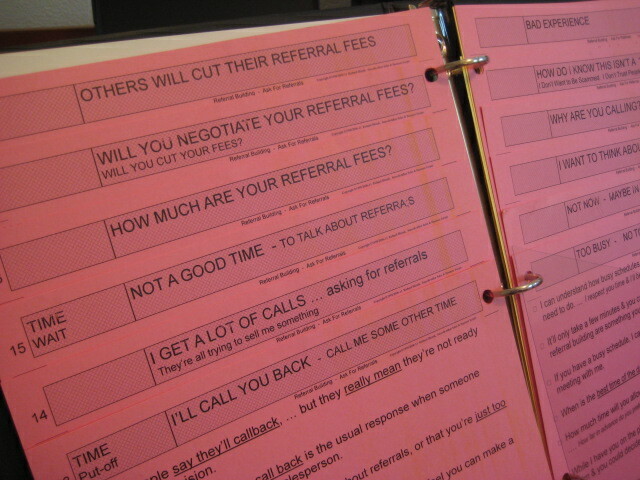 Smooth-talker referral scripts help you when calling someone you don't know for building your referral business. Calling a client direct is the most "cost effective" way to build your business. Building referral business through better scripting is a cost effecient way to build business by referral. Having a tool to help you when prospecting someone you don't know for building your business by networking has become one of the most sought-after elements of the business world him. The most valuable prospects you can get comes from a referral. There are many reasons why a referral client is the most valuable prospect you can get. For example; they come you come highly recommended and the prospect perceives you to be qualified to handle their business. You have no competition when you get a referral client because no one knows about them and no one can contact them. Networking for referrals is the hottest topic in the business world. Networking for referral business is the desired result of business development and lead generation. All you have to do to get referrals is to establish a networking group to develop referral business on a long-term basis. Establish a relationship with other professionals in your area and simply ask them to think of you when they come across a person who is an ideal candidate to buy your product or service. It was very difficult to write the scripts for prospecting for referrals. It's taken many years of development and research but we have come up with a script to address the prospecting of professionals for the purpose of joining a referral networking group. It was an extremely difficult to write because it not like prospecting to sell a product or service. You are essentially selling yourself and the services you represent. Writing a script for referrals has become one of the most sought-after elements in the business world. Make it easy for another professional to send a referral by keeping your name and professional profile in front of them. By having a well thought out plan done in advance for referral fees to be paid for sending a referral will guarantee that they will keep sending you referrals. Building referral business depend on eliminating the fear on calling. If salespeople are provided with something to support them, such as a referral script, they tend to forget their fears as if they didn’t exist. People get so wrapped up in their own fears that they don’t fully understand what is happening around them. Networking for new business and actually doing business with a customer are two completely different functions. 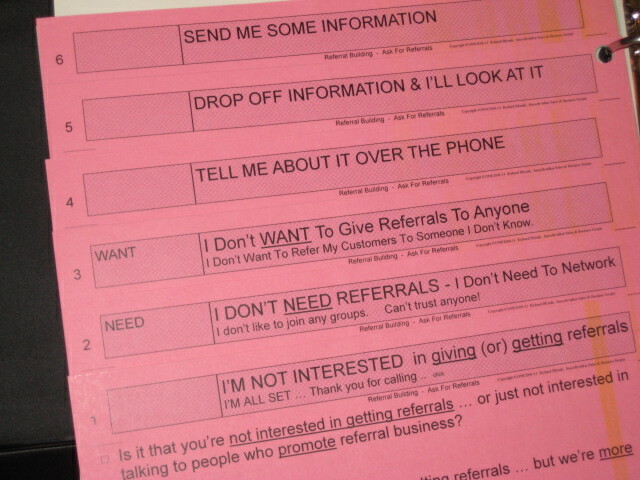 Say the right things to get referrals. The most important question of all is what are you going to say to another professional when you approach them. Getting referral business depends on having the right things to say. Having the right words is critical when prospecting the professionals who are in a position to send you to a referral. Having a networking prospecting script will keep you from avoiding the telephone prospecting call. Eliminate the stress of calling someone to ask them to join your referral network. People try to anticipate stressful situations when making prospecting calls. After a certain number of stressful calls are made, the prospector/salesman is in no mood to take on another traumatic situation. The dislike is so powerful that sales people find a way to avoid making calls to hostile prospects. Sales people can’t just do the fun stuff anymore. They’ll choose “schmoozing” existing customers any day over approaching prospects by calling them. Salespeople elect to do paperwork, nonessential work, and administrative busy work that should be done by others instead of calling other professionals for referrals. GREEN pages means you are doing the talking & conversing about the following .. Asking professional to join a referral network. Explain what a referral network is. Share ideas to build referral network. My plan to build a referral network. Invite you to a referral workshop. Old referral prospect, renew interest. Do you have someone to send referral to? Replacing prospects through referrals. Forming a referral network. I'm looking for professionals to recommend. Time For Reviewing Networking Services. Best Time to Meet - Appointment. RED pages. 24 pages contain Questions that must be answered & Objections that must be responded to. Respond with the most often heard objections. Up to 6 responses on each page. Each 1-liner offers a different approach to the objection. Do you have a referral to send to me? How do I know this isn't a "Scam"
I get a lot of calls. I Had A Bad experience with referral networks. 30-Second Commercial - aka: "elevator pitch" Profile of me & my company. 3 Reasons to Choose Me As Your Referral source. Why Meet With Me - Meeting Outline. 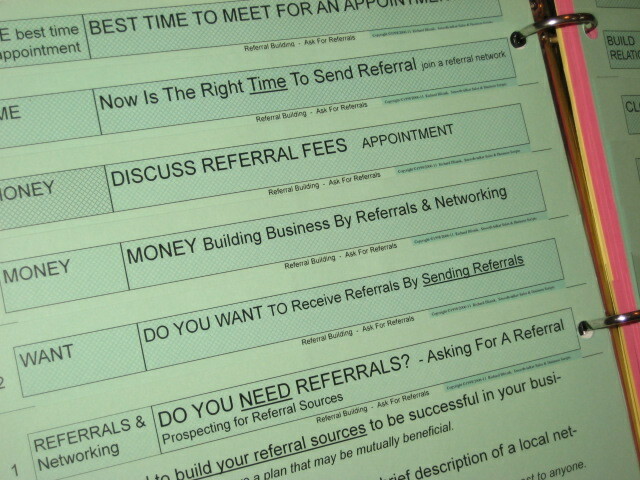 Referral scripts for networking help you say the right things to get referrals. The most important question of all is what are you going to say to another professional when you approach them. Getting referral business depends on having the right things to say to someone who will send you a referral. Having the right words to say is critical when prospecting the professionals who are in a position to send you to a referral.